2 to 8lbs, 12mth - Orange. Interceptor® Plus is indicated for the prevention of heartworm disease caused by Dirofilaria immitis; and for the treatment and control of adult roundworm (Toxocara canis, Toxascaris leonina), adult hookworm (Ancylostoma caninum), adult whipworm (Trichuris vulpis), and adult tapeworm (Taenia pisiformis, Echinococcus multilocularis and Echinococcus granulosus) infections in dogs and puppies two pounds of body weight or greater and six weeks of age and older. 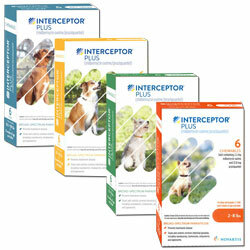 INTERCEPTOR PLUS is available in four strengths in color-coded packages for oral administration to dogs and puppies according to their weight. Each chewable flavored tablet is formulated to provide a minimum of 0.23 mg/pound (0.5 mg/kg) of milbemycin oxime and 2.28 mg/pound (5 mg/kg) of praziquantel. Milbemycin oxime consists of the oxime derivatives of 5-didehydromilbemycins in the ratio of approximately 80% A (C H NO , MW 555.71) and 20% A (C H NO , MW 541.68). Milbemycin oxime is classified as a macrocyclic anthelmintic. Praziquantel is an isoquinolone anthelmintic with the chemical name 2 (Cyclohexylcarbonyl)-1,2,3,6,7,- 11b-hexahydro-4H-pyrazino[2,1-a]isoquinolin-4-one. Over 100 lbs Administer the appropriate combination of chewables. INTERCEPTOR PLUS may be offered to the dog by hand or added to a small amount of dog food. The chewables should be administered in a manner that encourages the dog to chew, rather than to swallow without chewing. Chewables may be broken into pieces and fed to dogs that normally swallow treats whole. Care should be taken that the dog consumes the complete dose, and treated animals should be observed for a few minutes after administration to ensure that no part of the dose is lost or rejected. If it is suspected that any of the dose has been lost, redosing is recommended. INTERCEPTOR PLUS should be administered at monthly intervals beginning within 1 month of the dog's first seasonal exposure to mosquitoes and continuing until at least 6 months after the dog's last seasonal exposure. INTERCEPTOR PLUS may be administered year-round without interruption. When switching from another heartworm preventative product to INTERCEPTOR PLUS, the first dose of INTERCEPTOR PLUS should be given within a month of the last dose of the former product. Dogs may be exposed to and can become infected with roundworms, whipworms, hookworms, and tapeworms throughout the year, regardless of season or climate. Clients should be advised of appropriate measures to prevent reinfection of their dog with intestinal parasites. Because the prepatent period for E. multilocularis may be as short as 26 days, dogs treated at the labeled monthly intervals may become reinfected and shed eggs between treatments.